Anaconda Mining, a Canadian Junior, operates the Pine Cove Gold Mine and Mill located just outside of Baie Verte, Newfoundland. 3. Calculated at a gold price of US$1,200/oz. At Pine Cove, blast movement entirely displaced the small ore blocks. 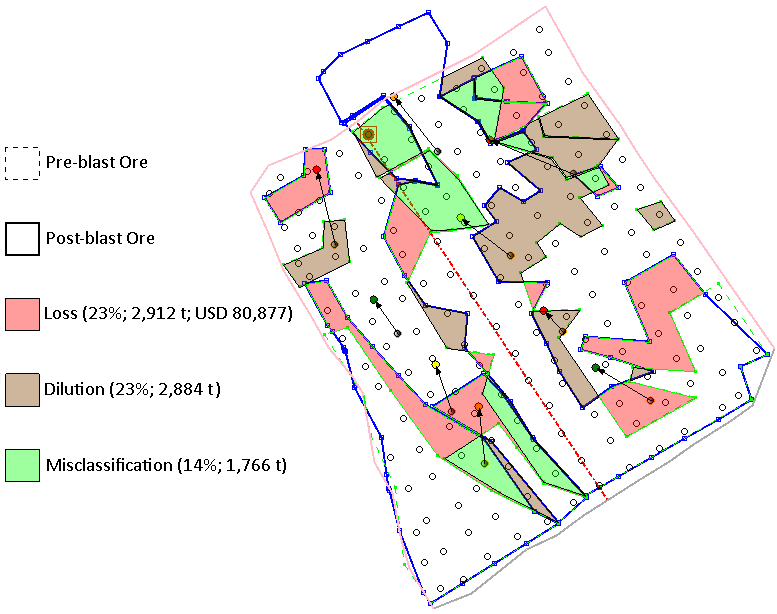 By accounting for movement in this example blast, the mine avoided 23% dilution and recovered an additional 2,912 t of ore.
Jordon Cramm, Mine & Engineering Superintendent, explains how the BMT solution has improved the blasting practices, and reduced dilution and ore loss at Pine Cove. The system has increased recovered value by US$15 – 30k per blast. Garry Luffman, senior geologist at Anaconda Mining’s Pine Cove mine, describes how the geology team use BMT’s blast movement monitor system to recover narrow ore zones. The thin areas experienced high dilution, over 20%, which resulted in lower feed grades through the mill. Using the BMM System, Pine Cove has reduced dilution to 5%, increased the grade and limited the waste going to the mill: realising US$15,000 to $30,000 dollars per blast.